There are questions that are fine that they don't in themselves deserve negative votes. However, sometimes such posts get unusually high votes. I understand that the up-vote and down-vote criterion is to vote the question that shows research effort, has good quality and few other things. Is it ethical to down-vote if you think a question is not bad enough to deserve a down-vote by itself but also that you do not like it receiving more votes than you feel it deserves? I wouldn't consider it unethical, but I personally do consider it somewhat improper to vote on questions/answers for reasons other than their content. And the voting behaviour of other users is a criterion quite separate from the content of any post. Moving my comment to an answer: not unethical, just ineffective. Using some of your $40$ votes/day to downvote too-popular questions won't make any real difference, and there are so many constructive™ things one could be doing on the site instead. Try to use your votes where they matter the most: moving the score of good posts from $0$ to $1$, and that of bad posts from $0$ to $−1$. The score of $0$ is the least informative of all: for all we know, the post could be really good or totally wrong, but never read by someone able to tell. Accordingly, SE software does not believe that a question has been answered until there's an answer with positive score. And there are way too many correct answers with zero score: see this post for some ways of finding them. 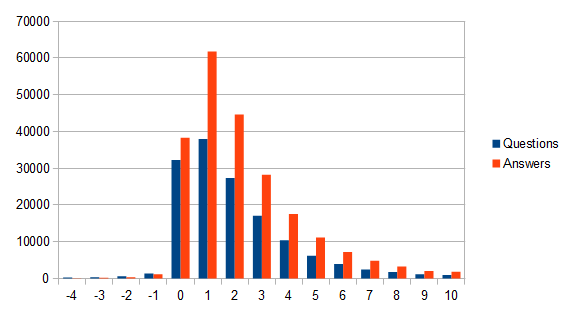 As an illustration, I include the current distribution of posts by score. Let's bring the zero columns down. Not the answer you're looking for? Browse other questions tagged discussion voting down-votes .